Designer and author Stephen Saint-Onge has a motto: “Good home design has the power to change your life.” So true. He stresses the importance of looking at your home through fresh eyes and seeing the potential it might have. 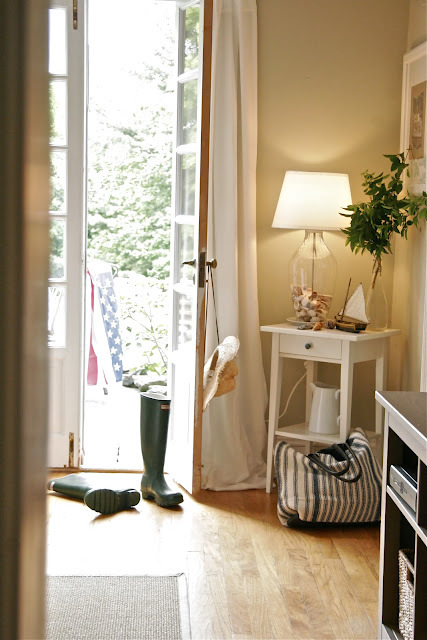 “There were great elements about the room–including the hardwood floors and the French doors leading to the garden. I felt as though I were in a French farmhouse in Provence because of the doors and the garden outside,” Stephen says. 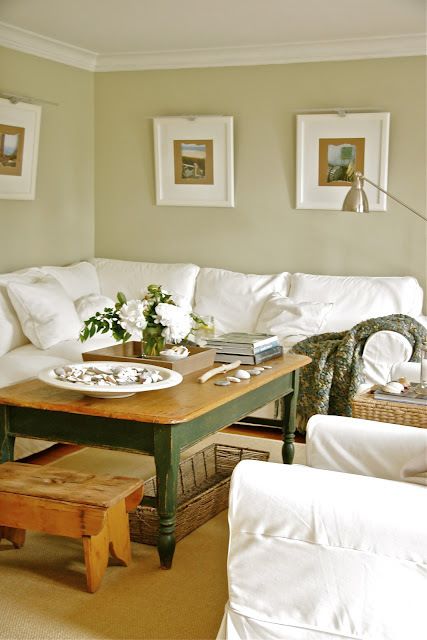 He painted the room with Benjamin Moore’s “Croquet,” a lovely pale green that makes their existing trim and moldings stand out. I like that it looks beachy without the usual blues. For the furniture he went with IKEA’s Ektorp sectional with white slipcovers (which is what I have in my sunroom–and I have the Ektorp chairs in my bedroom). I have to add that with mine I have found that those Tide-to-Go pens work wonders on things like chocolate stains (something we get a lot of around here, ahem)–they have bought me extra time between washings. It also helps if you spray that Scotchgard fabric protector stuff on the slipcovers first. There were already outlets around the walls of the room for lighting, so he used lighted frames that he plugged into them. Many thanks to Stephen for sharing his project and these beautiful photos with us. 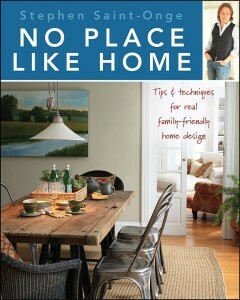 You might also like his book, No Place Like Home. He often finds inspiration from houses in movies and television shows, which is one of my favorite things (you’ll find features about them on his blog, too). Do you have a little-used room in your house that could be transformed into something else? Hooked on Makeovers? Check out my Before & After page–it’s full of ’em! P.S. This post contains Amazon affiliate links that help support my blog. Thanks! o.k.. Im kinda new to decorating. but how to you hang frames with lights and hide cords? Those are surely battery operated lights, hence cordless. We use them often, for the same reason you mentioned, when running a cord down on the wall takes away from the look of the room. There were outlets in the wall for hanging art already there, so they’re hidden behind the frames. He has more before photos on his blog that show the outlets around the wall and how he did it. You can also run the cord down into the wall by cutting a small hole behind the art and near the baseboard. This is more work and more complex. But it’s how a lot of flat panel TVs are being wired these days too. That’s a big fire hazard! Please do not ever run a cord behind the wall. It is not code and if it does cause a fire, your insurance will not cover it! I do love this room, though. That’s interesting, Donna – never heard that about code before. I’ll have to look that up. I see wall-hung flat panel TVs being connected this way all the time. Now you’ve got me all curious. I’m interested to know why an insulated cord is any more of a fire hazard than the less-insulated wiring already behind our walls. Research time! Donna, I learned something thanks to your comment! 🙂 There is a great article on Gizmodo about the National Electric Code. Thanks for calling that out. Love everything about this makeover. So many people don’t seem to want a formal dining room, most often you hear it from shoppers on House Hunters. I am ambivalent. I have one, we do use it for big gatherings and holidays but the other 355 days a year, we walk through it so I can understand why re-purposing a dining room makes sense. 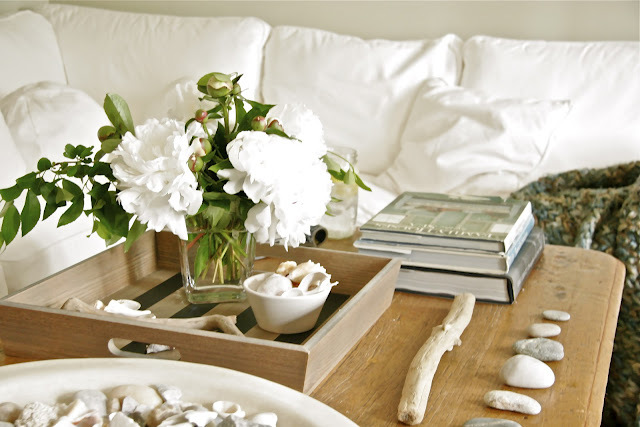 White is so crisp and clean, no matter the design of one’s home. I give this a ten. We have the smaller white covered IKEA chairs (Jenny) in a rental home we own on the beach. Most often tenants are good. On a rare occasion, we get suntan lotion grease from someone sitting down without thinking so we buy the white slipcovers by the gross and at only $29 per, it beats having to panic when the cottage has a tenant turnover if the slipcover is too soiled for the next. But great tip about the Tide to Go pen. Adding that to my shopping list NOW. Good job here! I’ve seen a number of family rooms I would like to turn into diningrooms (often nice fireplaces & capacity for furniture without banging chairs into it… or walls) while I would be happy to turn the smaller dining room into a cozy library or family room. This may be more feasible for an all adult household, but next time you look at family rooms (if you are an entertainer as we have always been) consider the possibilities! Great job! 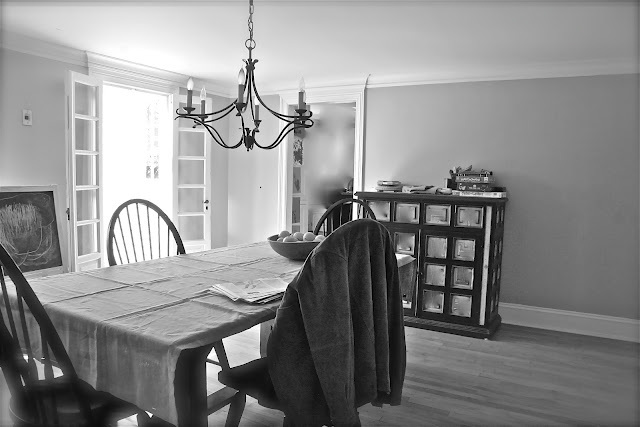 I often look at Family rooms and see potentially great dining rooms. Often they are graced with nice fireplaces or a bank of windows, usually kitchen close and large enough for a crowd without feeling crowded. Large furniture or long buffets (my choice rather than a breakfront china cabinet) fit nicely without chairs scraping or gymnastics getting into place to be seated. This may be more feasible for an all adult home or an entertaining family as we have always been. I think the cosiness of the usual size dining space could then become a library or cozy family-TV room. Next time you look…look. Love this! I have a large dining I seldom use. I turned it into a comfy den. I bought a folding table to use when I need extra dining space. Love Stephen’s work. Even tho I’m more of a color freak, this is just exquisite, and sooo inviting and warm. It’s also financially feasible, a big plus. I have some baskets like those that I got at Home Goods, and the IKEA furniture is some of the most affordable around. Most decorators can create a beautiful room when there are generous resources, but fashioning a room like this on a budget is the mark of a great designer. Kudos to Stephen and thanks so much for posting this. Great point about the affordability. This is a beautiful look you could create on a budget, for sure. What a beautiful and practical transformation! I really love his style! Beautiful room! 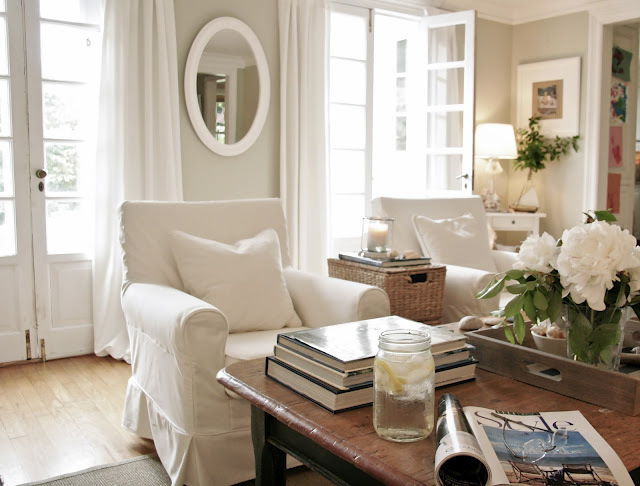 I love white rooms. The green on the wall breaks it up so it dosen’t look sterile along with the wood tables. Beautiful room. I love the colors and the light and the affordability. That room made me feel better just looking at it. Imagine how it would feel to curl up and read a book in one of those chairs for an hour. Lovely! 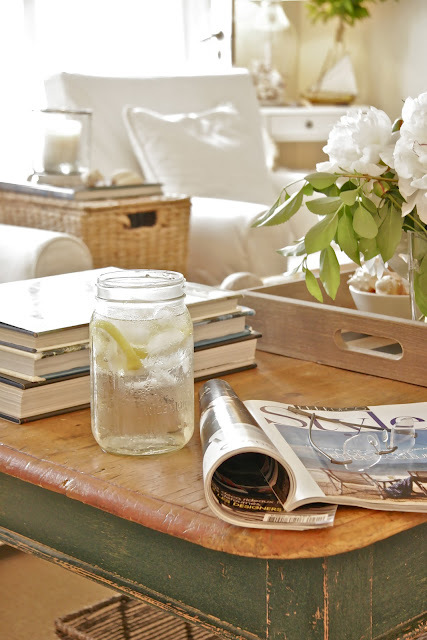 I like the notion that we should feel like we’re on vacation in our own homes! A great example of you using your things for your benefit instead of the things owning you! Sinnce I cannot knock down any wall because of expense mostly, I constantly reexaming our main floor rooms to tweek it for our family. Almost there! Time to look again. I agree, Stephen does deserve his own show. He’s a much better interior designer than most I’ve seen on tv. Love the room! He has a cool blog too, and he is currently traveling around promoting his book and Ikea products. If you are lucky, he may be in your area. 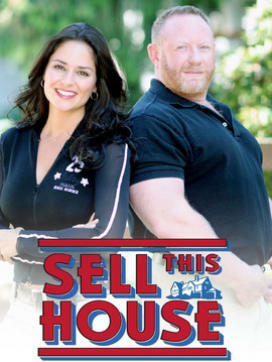 Go see him if he is! Gorgeous makeover! I love the design and colors. It gives the room that calm and relaxing feeling. I love this look. So clean and yet so comfortable. I have one of these chairs in my bedroom and I always get so many compliments on the looks and comfort. The windows are gorgeous in that room! 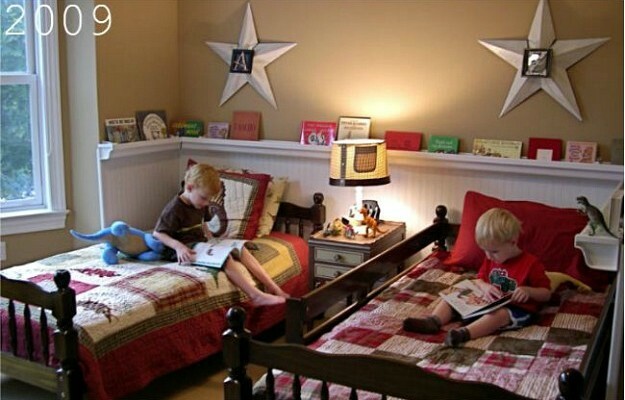 He did a wonderful job creating a comfortable and beautiful room. Had to add this blog to my bookmarks! Gorgeous room. Thanks for the post, Julia! Lovely makeover, but I want to mention that Scotchgard fabric protector is poison. My uncle is a pediatrician who specializes in childhood allergies and he sees young children come in with horrible rashes and breathing reactions from this product. He thinks it’s one of the household chemicals that triggers children into developing allergies and asthma. We really don’t these toxic brews in our homes, and especially not around children. Poison? Oh, my. Well, I did spray it on outside and waited for it to dry before bringing it inside. We haven’t had any issues, but that’s definitely something to consider if you have kids or pets. Now THAT’S a room that beckons you to relax with a good book and/or a yummy cocktail! (although nix the thought of red wine). Adding his blog to my favorites now. Great post, Julia! Love all your comments about my makeover. THANK YOU! Plus, a great big thank you as well to Julia (whose blog I love personally!) – for sharing this makeover. It truly has become one of my favorite makeovers to-date. More to come….Enjoy the rest of your summer everyone! Wow!!! What a before and after!!! Love the way it turned out! Great family room table! I love Stephen Saint-Onge! I have his book and use a lot of his ideas for real. How cool it is that he commented ! Love it. I find it a big job to wash slipcovers. Do they go in the dryer? The white is so pretty, but, I don’t think I could handle it. I ‘ll just have to admire everyone else’s. I wouldn’t put them in the dryer. I hang mine to dry, just to be safe. So much to appreciate in this room’s makeover. I’m especially drawn to the paint color and can see it working in my own dining room. 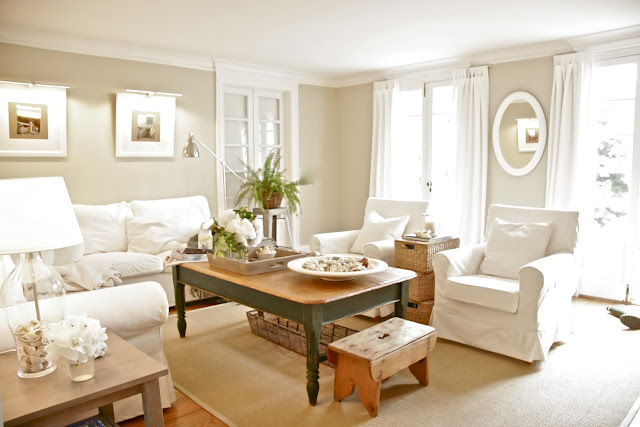 While I’d love to incorporate the big comfy chair idea, too often I need a lot of seating around my table. I do love this look though and see several tips I could use. Thanks! I love this man! That rooms looks amazing. I own his book and I always enjoy any room he redoes. The only thing I don’t get is the white slipcover thing. Julia, I know you have them , but to me , washing them is a big deal. I have camel colored ones, and I can’t imagine washing them often. I’m nervous that they’ll get dryer burn, so I hang them on my deck in the sun, but that’s only in nice weather. Anyhoo, this makeover is gorgeous, I’m going back to steal some ideas.. Thanks!